Emily chiffon flowers are made with a mixture of chiffon fabric and lace. Centre is embellished with two pearls and a clear bead on a felt backing. These flowers are perfect for hair accessories, scrapbooking, invitations and any craft you could think up. With so many flower styles and so many colours to select from you will be in Craft Heaven. Making headbands and need elastic to match your flowers. Then you need to check out our huge range of fold over elastic. With over 90 colours of fold over elastic instock we are sure to have a shade to suit your project. 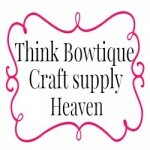 Think Bowtique is craft supply heaven. We stock everything from grosgrain ribbon, satin ribbon, fabric flowers, elastic's, tulle, rhinestone embellishments, pearl embellishment, headbands and hair clips. Grab a coffee and browse store.